Amaan Iqbal Ibrahim is working to support hundreds of migrant workers across the UAE. Last year, we recognised him with the Legacy Award. Greetings Earthlings! My name is Amaan. I am almost 17 years young and in my 12th and final year of school. 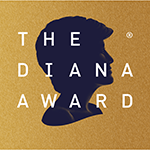 I won my Diana Legacy Award in 2017. For what cause, you ask? Let me tell you. It was a hot, grueling Ramadan afternoon. I had just returned home and was about to take a nap, when my dad took me to the car. “Where are we going?” I asked groggily. “You’ll find out soon enough” said my dad. We kept driving on for half an hour and we reached a dusty old shed. He took me in and what I saw in there changed the way I looked at life. In that tiny shed were hundreds of men with ruffled hair, bare feet and empty plates. In a single line, they filed into the shed. They sat upon the bare ground, looking up at us, expectantly. I was shocked to see hundreds of laborers, hundreds of our unfortunate brothers, crammed up in that shed, knowing that this Iftar would be the best they would ever get… In a daze, I was drawn into a crowd of people, serving food, juice and water, distributing plates. 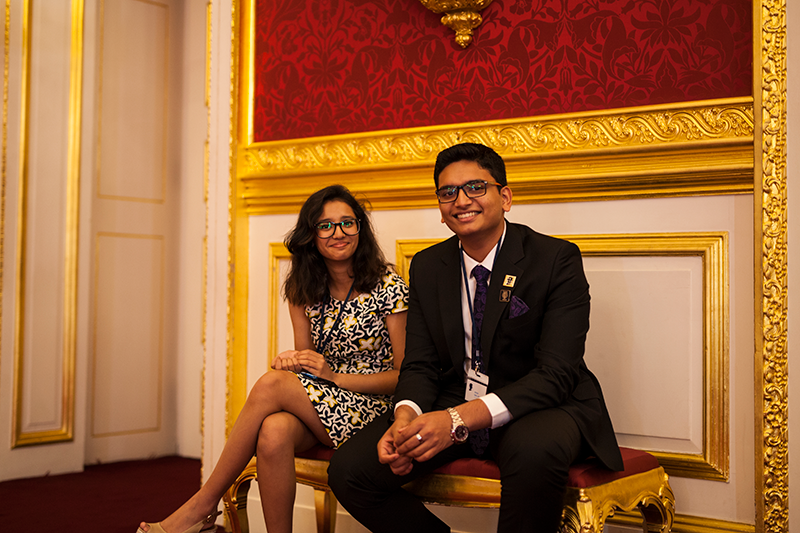 Amaan gets ready for the Legacy Award Ceremony at St James’s Palace with fellow Award Holder, Nikhiya. Every time I placed something in front of a brother, their face would light up and they would smile up at me. At that time, I felt something I had never felt before. But I didn’t know what that was. I continued helping around and finally sat down and saw that a plate of food and a cup of juice had been kept in front of me and let me tell you that was the most fulfilling Iftar I ever had. I then identified the feeling. I had felt happiness beyond me. The U.A.E, a country that endorses giving, has almost 9 million laborers, who get accommodation and whatnot, but have to leave their families behind, thus causing them to feel extreme loneliness. Our initiative intended to change just that. So we made sure that we not only distributed the food among them, but we also ate and spoke alongside and with them. The average laborer earns about AED 700 per month. That’s about 120 pounds. And if we gave them a decent meal every day then we could save them almost AED 200. This helps them send more money to their families back in their native lands. And since 2017 was declared by the U.A.E as the Year of Giving, we thought it the optimal time to boost our pre-existing state. And that was the goal behind the Budding Humans Initiative. There were a few roadblocks we faced- funding, transportation etc. But as our numbers grew, the ideas got better and better until, with the green light from my school –Our Own English High School-we were able to go to a labor camp with utmost confidence and without any fear of shortcomings. 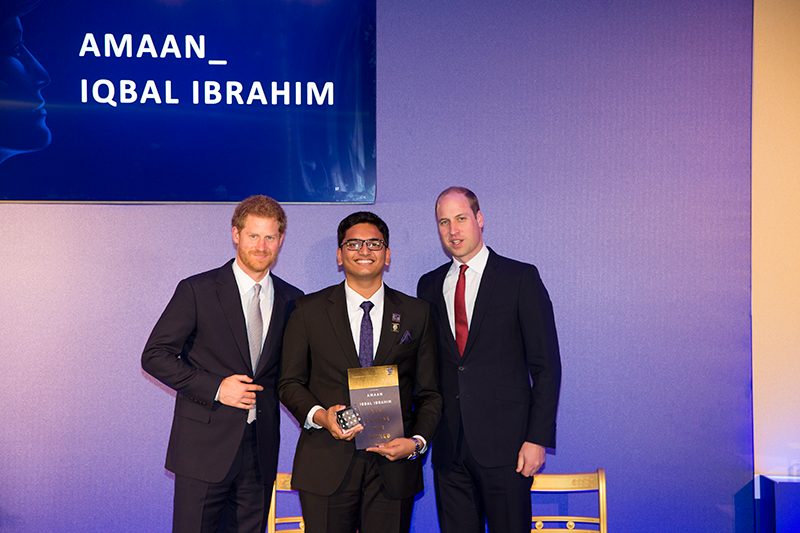 TRHs The Duke of Cambridge and The Duke of Sussex present Amaan with his Legacy Award. 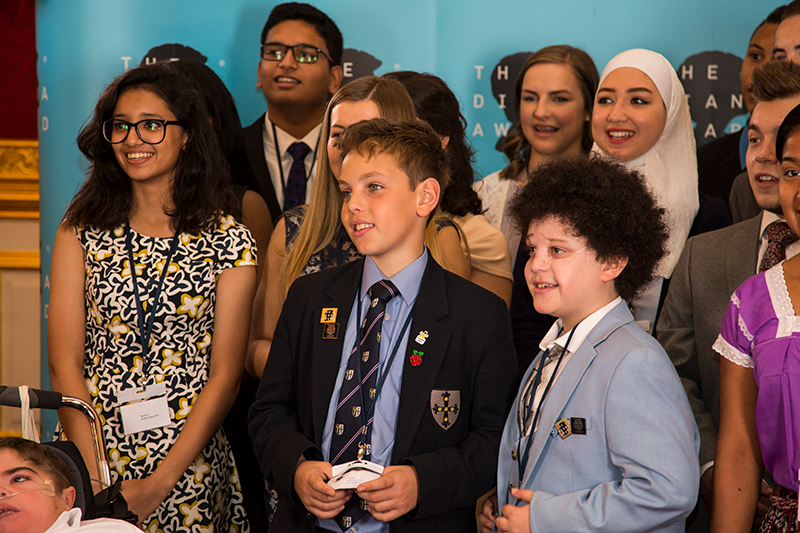 Frankly speaking, I didn’t even know about my nomination until I got an email from The Diana Award saying that I’ve won not only the Diana Award but the Diana Legacy Award, also making me the first and the only person from the Middle East and one of the two from Asia to win this coveted honor. As you can imagine, I was on Cloud 9! I deeply thank my school for nominating me and for seeing in me something that I could see only after I held that heavy, crystal cube in my hand. My attraction to social work was inspired by one person- my late grandfather- Professor A.P.Ibrahimkutty. He used to say to me quite often, “Amaan, in life, be like a geometric compass. With one leg stay rooted to your values and with the other go around. Help others and learn from others. Only then will you achieve true happiness in life. And your life should be lived in such a way that you journey through it with maximum happiness, victimizing none and leaving the world at least a bit better than the one you inherited.” I hope and continually pray to the Almighty that my grandpa is looking at me, eyes brimming with pride, at each and every moment of my life. And that has been my purpose. For as the great poet Francois Rabelais once said, “I go to seek a Great Perhaps.” And I hope to God Almighty that one day, I will find it and when I do, I will be with the ones I work for and be doing what I love most- serving. What does it feel like to have won the Award? It feels like I’ve gotten a step closer to reaching my Great Perhaps.